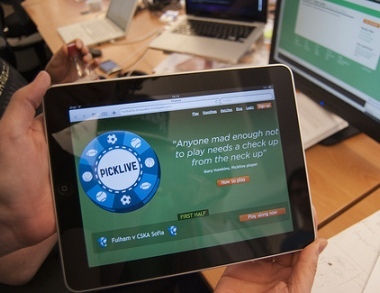 Picklive continues to enhance its TV Football gaming experience whilst developing an iPad version of its app for armchair soccer fans. You might have seen the The Next Web’s coverage of Picklive, the online app which aims to add a gaming element for TV sport viewers in the UK. It’s an app which works great on a netbook or a standard laptop, whilst you are sitting in front of the TV watching ‘the big game’. However, when we took at look at the app, the first thing that struck us was just how well it could work on the iPad. The links between TV viewing and online interaction are growing increasingly blurred and the iPad’s early popularity as a general purpose household device means it will undoubtedly have a role to play as our TV/online behaviours continue to merge. For the Picklive team, a non-Flash iPad version of their app is well and truly in the works… they hope to launch it ahead of the World Cup. In the meantime, I took the current app for a test drive last night using my trusty netbook whilst watching last night’s pre-World Cup friendly between England and Mexico. Once you’ve registered a user-name, the gameplay is fairly straightforward. Looking at a layout of all 22 players on the pitch you simply select three from any side to become your team. You then play against other online gamers and score points based on the the number of successful passes made by your selected players during the live match on TV. Extra points are earned for goals and points can be deducted for fouls. As the real game progresses you can see the players rack up points based on their actual activities on the pitch. Based on your selection your own ranking amongst up to ten other gamers fluctuates as relative performances change. You can even make mide-game substitutions if your players aren’t getting to the ball often enough. Last night a mini-game of Picklive lasted ten minutes interpersed with a minute or two in the lobby whilst creating or joining someone else’s game and selecting players. From today, mini-games will last 7.5 minutes and will commence as soon as enough gamers have come on board. This change is to enable four full sessions during each of the 45-minute halves of the real game and is symptomatic of the rapid and responsive way in which the Picklive team is developing the app based on actual usage and gamer feedback. I though it was a fun experience, but am glad I put off trialling it during a couple of recent Coca-Cola League play-off games where I had an real interest in the outcome (well done Blackpool, hard luck Huddersfield). That’s not to say I didn’t want England to win last night, but monitoring your Picklive performance is quite absorbing and I did find myself forgetting to watch the actual game. Give it a try and let the team have your feedback. Games are played for notional points at the moment, ahead of Picklive’s plans for introducing a ‘pay to play’ model. Play in any of the games in the run up to the start of the World Cup on June 11th and you stand the chance of winning an iPad. The next chance to play Picklive is tonight’s game between the Republic of Ireland and Paraguay. The match kicks off at 7:45pm and can be viewed on Sky Sports 1 & HD1.